Astronomers have discovered the first Earth-sized planet outside the solar system that has a rocky composition like that of Earth. Kepler-78b whizzes around its host star every 8.5 hours, making it a blazing inferno and not suitable for life as we know it. The results are published in two papers in the journal Nature. Scientists supported by NASA have detected water locked in mineral grains on the Moon. The findings hint at unknown water sources deep below the lunar surface. Data for the study came from the NASA-funded Moon Mineralogy Mapper (M3) instrument aboard the Indian Space Research Organization's Chandrayaan-1 spacecraft. 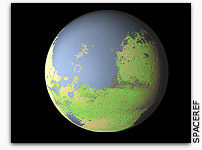 Scientists studying data from NASA's Mars Reconnaissance Orbiter have discovered new evidence that Mars may have once had a vast ocean on its surface. The research team spotted an ancient delta where a river might have emptied into an ocean so large that it covered much of the planet's northern hemisphere. The Astrobiology Program has been the sole source of funding for biennial AbSciCons from their beginning. However, restrictions on federal spending on conferences and budget limitations due to sequestration have led us to determine that the Program cannot support an AbSciCon next year. We regret this decision as much as you do, and it was a hard one to make. Oxygen in the atmosphere and ocean rose dramatically about 600 million years ago, coinciding with the first proliferation of animal life. Since then, numerous short lived biotic events -- typically marked by significant climatic perturbations -- took place when oxygen concentrations in the ocean dipped episodically. We explore how questions related to developing a sustainable human civilization can be cast in terms of astrobiology. In particular we show how ongoing astrobiological studies of the coupled relationship between life, planets and their co-evolution can inform new perspectives and direct new studies in sustainability science. 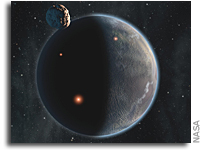 Previous attempts to describe circumbinary habitable zones have been concerned with the spatial extent of the zone, calculated analytically according to the combined radiation field of both stars. 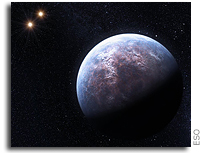 Finding life on exoplanets may be more difficult than people thought, said Feng Tian, a professor at the Center for Earth System Science at Tsinghua University in Beijing, China. The report is being presented today to the American Astronomical Society Division for Planetary Sciences meeting in Denver, CO. The result is of special interest because it may shed light on how and where life could be identified on exoplanets.